The Ski Sizing Chart To Get Your Ski Length! To find your ski length, add your results starting with step 1 to 4. What Type of Ski Do You Want? Add up all your numbers to determine your ski length. Use the above chart for reference only. Save on Closeout Ski Boots. 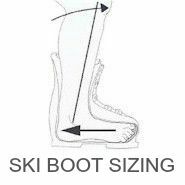 Do You Have the Correct Size Ski Boot? If you want to improve your skiing competency, having the correct gear for your ability level, skier type and weight is essential. Too often people have difficulty skiing and blame themselves when they are unable to control their skis, when the cause is a ski too short or one that is the wrong construction and ability level for them. The most important factor is having a proper performance model, then the correct length based on your weight and height. Choosing a ski length is more complex than your weight is X and your ski length is Y, as varying ski widths and construction come into play. Choosing the ski model should not be done based on the graphics/color or because your friend likes that ski. Skis are measured in centimeters and not all manufacturers use the same standard method of measuring. One will measure the material length following the curve of the ski, whereas another will measure the ski height. Most important is proper performance model, then the size based on weight and height. Shorter skis are not easier to turn! Having skis that are too short to support your weight will have a lack of control, lack of response or rebound, and will not absorb the vibration when at a higher speed. Having skis the correct length will allow your body weight to be distributed properly along the edge for smooth effortless carved turns, making the ski do the work while you use less energy. Doing research online for 30 minutes is a waste of your time when you could spend 30 minutes with an experienced ski pro who has years of skiing experience and product training from ski manufacturers. Getting a cheap pair of skis that are not good for you is not a good deal. Few consumers have the product knowledge of the various makes and models’ of skis available or past models if bought used. And do not waste the ski pro’s time and buy your gear somewhere else or the ski pro will not be around when you do need them to fix your bindings or the gouges in your ski base.